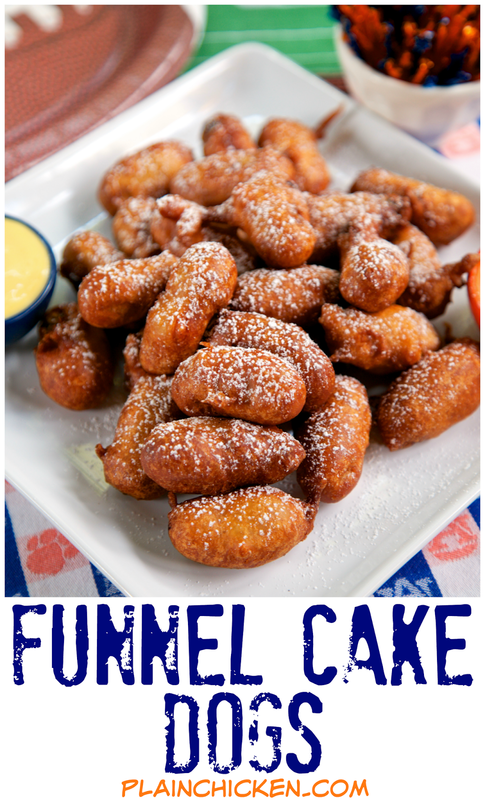 Funnel Cake Dogs Recipe - great for tailgating!! Little Smokies battered and fried. Dip in honey mustard or plain honey. Fun twist on our usual pigs in a blanket. Great party food and tailgating food! We were in the grocery store a few weeks ago, and saw a box of Funnel Cake Corn Dogs. Now, I'm not going to lie. 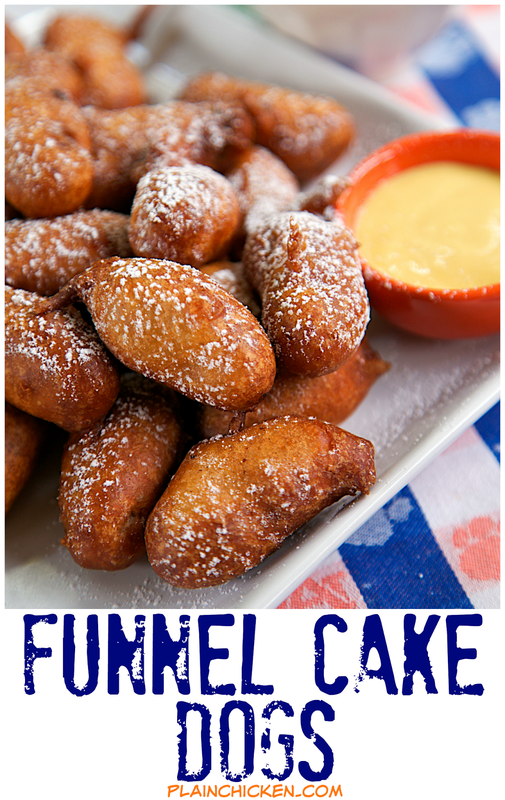 I love a good corn dog, and the Funnel Cake Corn Dogs totally intrigued me. I had to try my hand at a homemade version. I decided to make a mini version for tailgating and watching football. These were actually really good! I sprinkled the Funnel Cake Dogs with a little powdered sugar, just a touch. We dipped them in some honey mustard and plain honey. I liked the honey mustard best and Chicken Legs preferred the plain honey. They were a fun twist to our regular pigs in a blanket. Pour oil into skillet or Dutch oven to a depth of two inches. Heat oil to 350 degrees. Prepare funnel cake mix according to package directions. Remove little smokies from package. 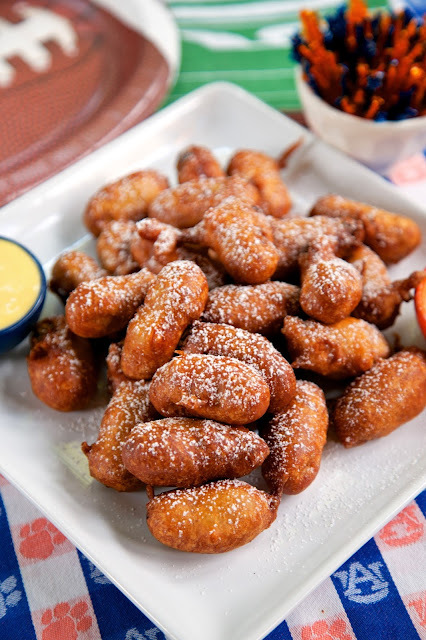 Roll little smokies in flour. 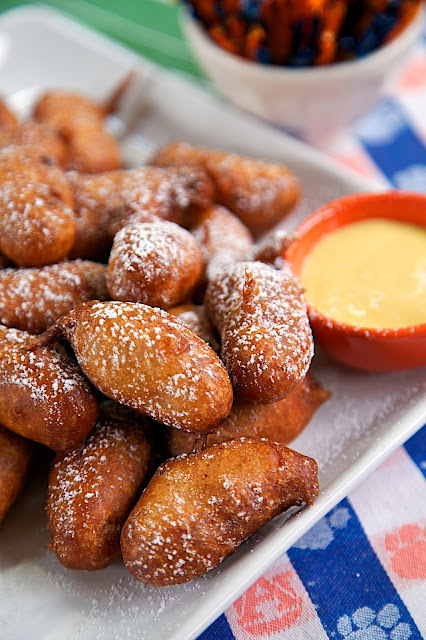 Dip into prepared funnel cake batter. Shake off excess and place in oil. Fry 2 to 3 minutes, until golden brown. Repeat until all little smokies are battered and fried. Serve with honey mustard and plain honey. Made this for the 2nd time tonight. My family loves them. Made this for the 2nd time tonight. My family loves these.